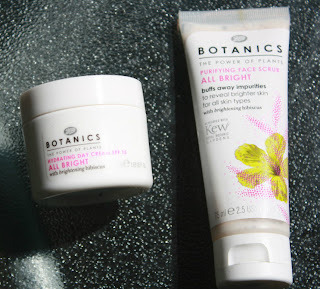 In desperate need of an affordable moisturiser and exfoliator that I would actually enjoy using, I nipped into Boots on my lunch break a few days ago and triumphantly emerged moments later with a jar of Botanics All Bright Hydrating Day Cream and All Bright Purifying Face Scrub. 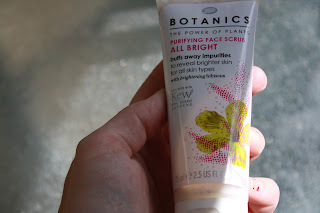 For me, the selling point of the Botanics range of lotions, scrubs and cleansers is the fact that they contain plant extracts approved by the one and only Royal Botanic Gardens in Kew, which is about ten minutes on the tube from where I live. This shouldn't really excite me, but it does. Aimed at normal to dry skin, this muddy- pink cream contains hydrating Hyaluronic Acid - basically another name for Restylane, (which is the stuff that people have injected into their face to smooth lines). The cream is rich in Hibiscus flower extracts, which leave the skin smoother and brighter thanks to the gentle exfoliating properties of AHA's that occur naturally in the flower. 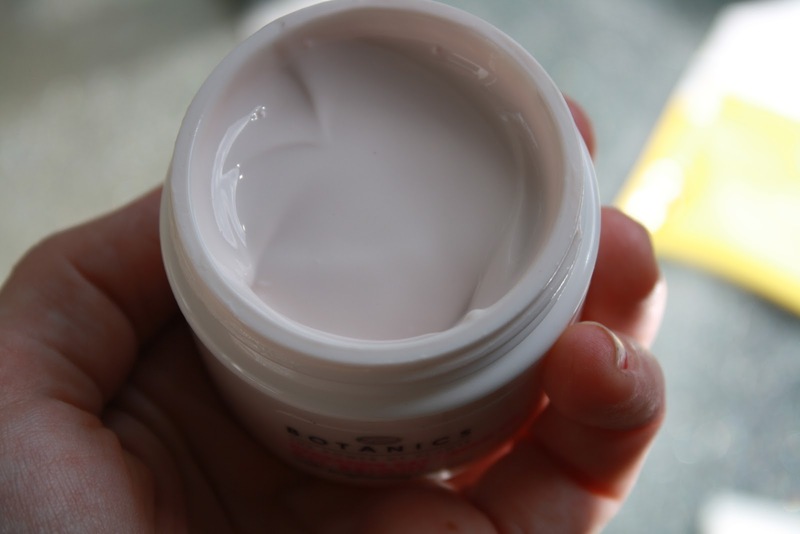 So far, I'm rather enjoying this hydrating cream. 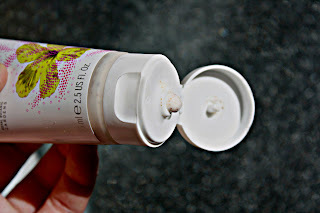 The consistency and colour are a definite change from the usual white hue of moisturisers and the scent is lovely and floral. There have been arguments against grainy facial scrubs, with some claiming they do more damage than good as the grains can scratch and tear the delicate facial skin. This could be true (and I do prefer fruit enzyme exfoliators such as Origin's Never a Dull Moment) but there's no denying the fresh, zingy feeling you get after a session with a good scrub! Designed to be used 2 or 3 times a week, this scrub contains crushed walnut shell and apricot seeds that work in tandem to banish flaky bits of skin and Hibiscus, which takes care of the brightening side. The scrub also contains ultra soothing shea and cocoa butters and sweet almond oil to counteract the gritty bits. I would compare this to St Ives Apricot Scrub - it basically feels the same, but perhaps a little more gentle and my skin feels kind of 'minty' after using it. Have you tried anything from the Boots Botanics range? ?